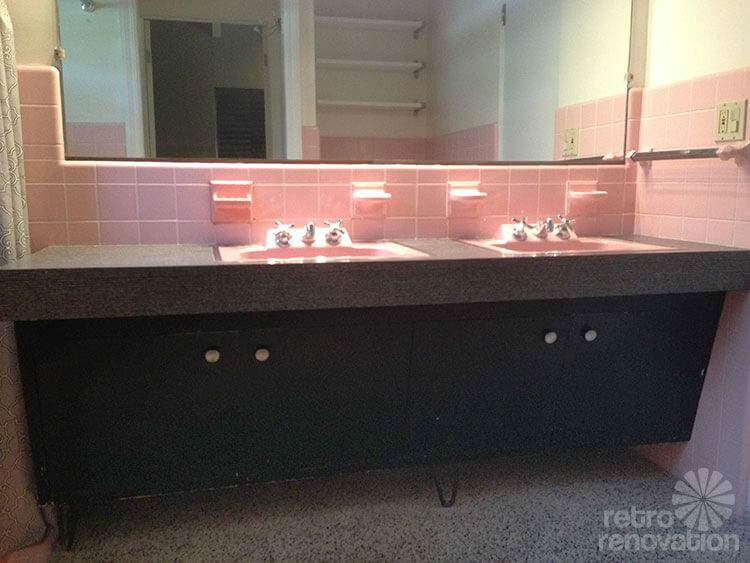 Gus recently discovered Retro Renovation while searching for advice about the vintage pink bathroom in his newly purchased 1956 home. While he is a fan of mid century design, Gus isn’t sold on all of the pink in his master bathroom. In addition to his uncertainty about the color, Gus wishes his bathroom had a few more functional updates — such as more storage in the shower for toiletries. 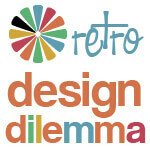 So, Gus has asked us for our ideas to help with his Retro Renovation Design Dilemma. I’m a 30-year-old male from Florida and I recently purchased a 1956 mid-century modern home with terrazzo floors and exposed beam ceilings. 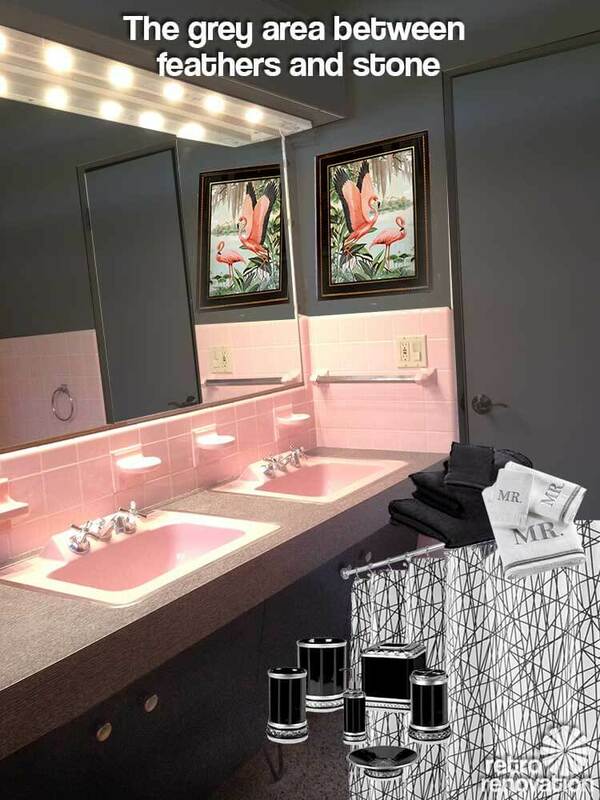 The house has a pink master bath (half of all walls tiled in pink, terrazzo floor, pink sunken shower, weird angled vanity, metal ring around pink double sinks… basically classic pink bath). Some of the tiles have flamingos and fish picture tiles (I’m guessing original owners did it since it’s Florida). To be honest… I h*** [edited] them. I want to re-tile with a “friendlier” color scheme for re-sale. Am I really ruining good potential? Is there any compromise I can easily do (wall color…take down some portion of the tile, etc)? Update faucets? I’m trying to be opened minded (since I want to stay true to the mid-century vibe), so please don’t take my post the wrong way. It’s just difficult to envision me as a retro lover. Anyone have advice on how to incorporate “new” features with the retro? I want to make the spaces more masculine and fit my personal style which is mid century modern, but I feel the amount of pink makes it a little too monochromatic for me. Since I need to remove some tiles to replace the shower fixtures, what should I replace them with? I also want to add a niche in the wall to hold shampoo bottles, but the only place would be by the flamingo tiles. As a fun bonus I added some photos of my second bathroom too! as well as add some storage to the shower area? 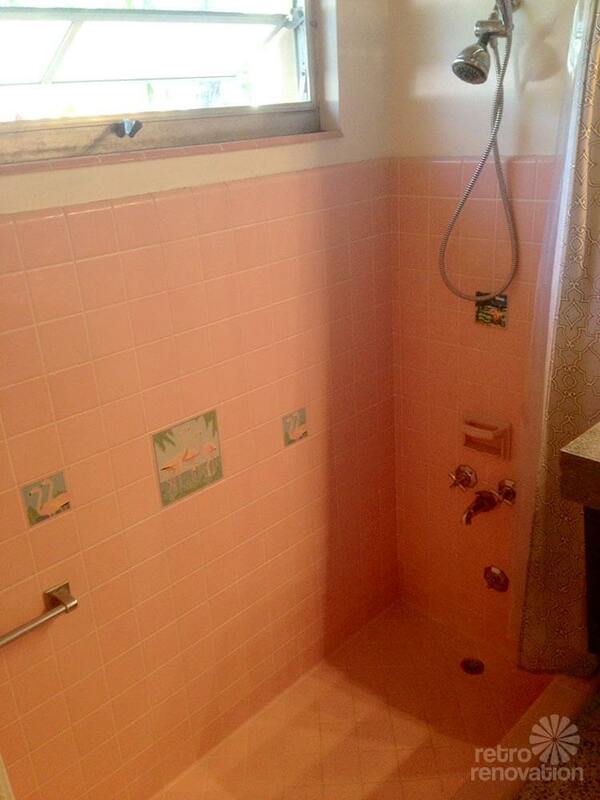 Gus, I really like your pink bathroom. 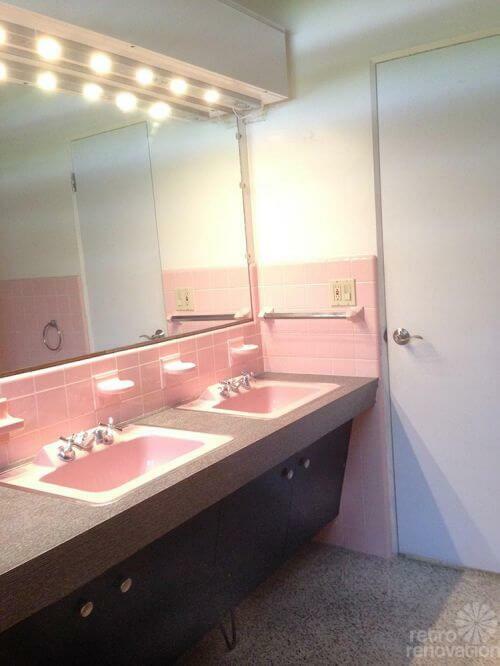 The vanity and sinks are my favorite part. It isn’t often that you find a vintage vanity like that with hairpin legs and an extra thick laminate countertop. The sinks are gorgeous and the whole bathroom looks to be in very good condition. As someone who is still working on building a retro pink bathroom of my own (having demolished a bathroom with poor layout that was not in good shape) I would recommend leaving as much of this bathroom intact as possible. It is hard work to gut one of these (likely) cement set tile bathrooms and costs lots of money to rebuild the bathroom afterwards. 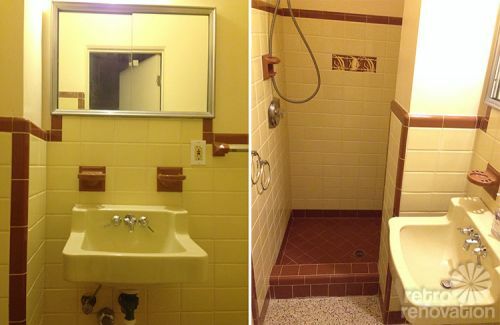 “Re-tile with a friendlier color for resale?” Wait! With the rise in popularity of mid century and retro design in the last few years, more and more house hunters are looking for original character and details like this. My advice would be to renovate this bathroom as minimally as possible. You can never know what the next owners of the house will want. 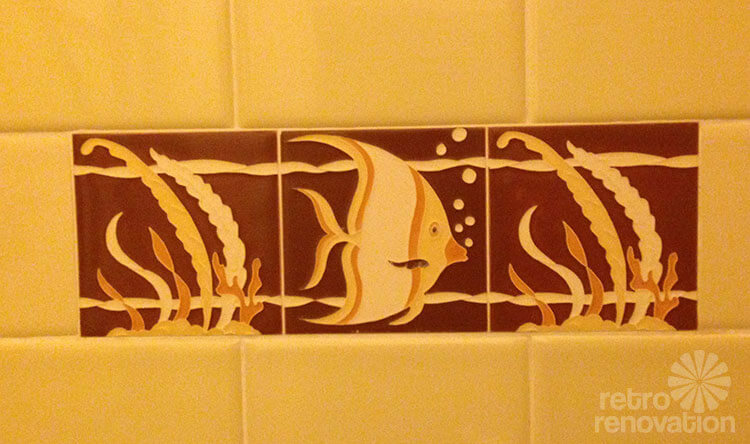 They could dislike whatever you might want to do to this bathroom. We are advocates of “love the house your in” here, but we also recognize the homeowner’s need to make their house work for them. That being said, it is always best to live in your house for a while before making any expensive or extensive changes. That way you can see what you like and dislike about each room before doing anything drastic or irreversible. Since the original vanity is black with a neutral patterned grey laminate top, I suggest you add more of these elements to the room. Painting the walls a dark grey will help make the room feel less pastel pink immediately. 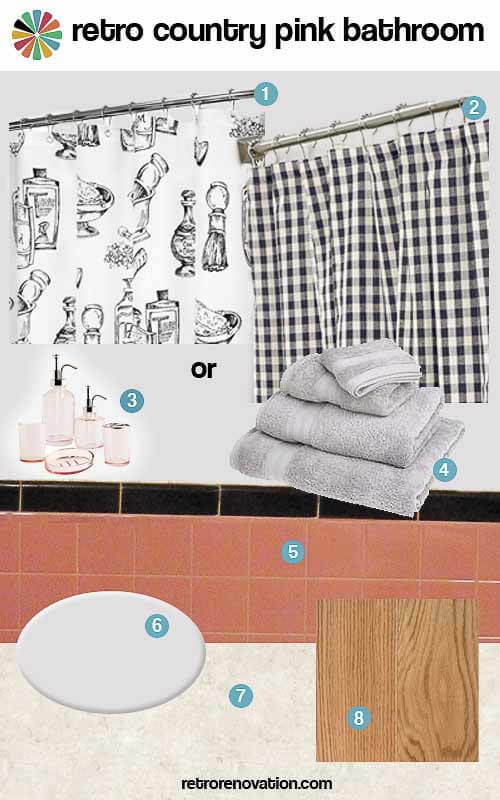 This look was inspired by our recent post on Robert’s pink and black bathroom makeover. Just as Robert played up the black trim tile in his bathroom, adding more dark grey and black to your bathroom will make it feel more masculine. Once you have the walls painted, it is just a matter of adding some accessories to the space. This black and white abstract design shower curtain mimics the design on the laminate counter top and has a modern feel. Black bath towels coordinate well with the room or, to give a nod to the vintage “His and Hers” towels that were common in the 1950s and 1960s — a “Mr.” hand towel gives a nod to the vintage while also proclaiming “this is a man’s bathroom.” Shiny black and chrome bath accessories add polish to the space. Finally, adding a framed vintage flamingo print or two framed in black — like these from Ebay seller yorkietoy — repeat the flamingo theme from the decorative shower tiles without going overboard. For this mood board, we continue to play up the black and grey in the space. Instead of paint this time — this Cole & Son flamingo wallpaper pays homage to the vintage flamingo shower tiles and the house’s tropical location in Florida. Adding a third color — the teal green from the wallpaper — gives the room more visual interest. Repeating this teal green in the towels and vinyl bubbles shower curtain helps the room’s design feel more cohesive. Finally adding a shiny stainless steel bath set helps repeat the chrome from the fixtures and hardware. When it comes to finding space to store your shampoo in the shower — instead of taking out tile to add a recessed niche — consider installing a ceramic corner bath shelf like this one, which can be applied to the existing tile without tearing anything out. Tile expert Bungalow Bill reminds: “I might rethink permanently personalizing and making a master bath masculine if you’re concerned about resale. Your next buyer may not be a man. What would make a buyer want something is knowledge. Your decorated tiles are very special and collectible. They were made by the American Olean Co. You can find a page from an original catalog in another RR post picturing these tiles. The colors on the flamingos make them especially desirable. Most likely they are also embedded in thick cement and would be impossible to remove safely. To replace just that central tile would cost between $300-600. Why not add a grey or black marble / granite shelf above the top border? Tone the pink down with shades of grey accessories.” CLICK THIS PHOTO TO SEE MORE OF THESE VALUABLE DECORATIVE TILES. Gus, Gus, Gus. 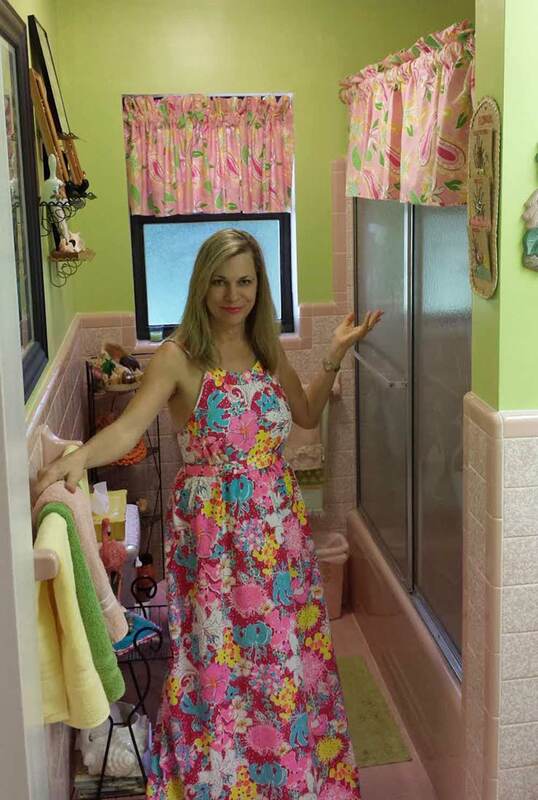 Your pink bathroom looks to be an absolute gem. You knew we would say that, though, didn’t you? I think that Kate’s mood boards are fabulous — so I don’t even need to do one. Remodeling for resale is quite often, a fool’s paradise. Read my story “Remodel and watch your investment plunge.” You typically do NOT make your money back when you remodel. There are plenty of folks who are looking for vintage houses with original features. Make that your goal if you plan to sell… Find a real estate agent who specializes in listing and selling mid century properties and as a result, connect with the kinds of people most interested in these vintage/historic houses. Read this important story, with interviews with three such experts — How to sell a midcentury house full of original features. I am covering my ears at the mere thought your considering removing those vintage flamingo tiles — which our resident tile expert Bungalow Bill points out are worth hundreds of dollars today! Virtually everything in that bathroom is SUPER COOL. You just need to get your head around a style that you may not be accustomed to seeing. You can do it, we know you can! A super key rule for any serious Retro Renovator just getting into their house, which may have features that at first, seem “odd” or undesirable to them: WAIT AT LEAST ONE YEAR to do anything you could later regret (unless there are safety or environmental issues, of course.) Learn about what you have… see if your mindset changes once you fully understand its history. 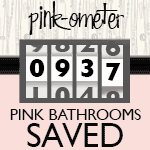 Be sure to read everything on our other little website, Save The Pink Bathrooms. You are now the lucky caretaker of one of the most famous and, increasingly, most desirable features in a mid century house. Go with the flow! If you need replacement pink tiles for the shower area, see this story about World of Tile, which carries 95 colors of replacement pink tile. As many readers have mentioned — all the tiles in your bathroom are likely “mud set” — that is, set into cement. These are hallacious to take out. You will have a ginormous mess on your hands if you try to take out just a few. Oh, and your other bathroom, equally fabulous. For more storage in the shower, try this Simplehuman Adjustable Tension Shower Caddy (affiliate link) — preferable if it will fit your floor-to-ceiling height. If your ceiling is too high, go for Simplehuman Adjustable Corner Shower Caddy (affiliate link). A reader recently recommended these Simplehuman shower caddies — and I bought them for my bathrooms (one each.) They are very nice. They fit a lot of bottles. You have a really long shower — you definitely have the space. Don’t mess with that tile! If there are plumbing issues — can you go in via the other side of the wall? 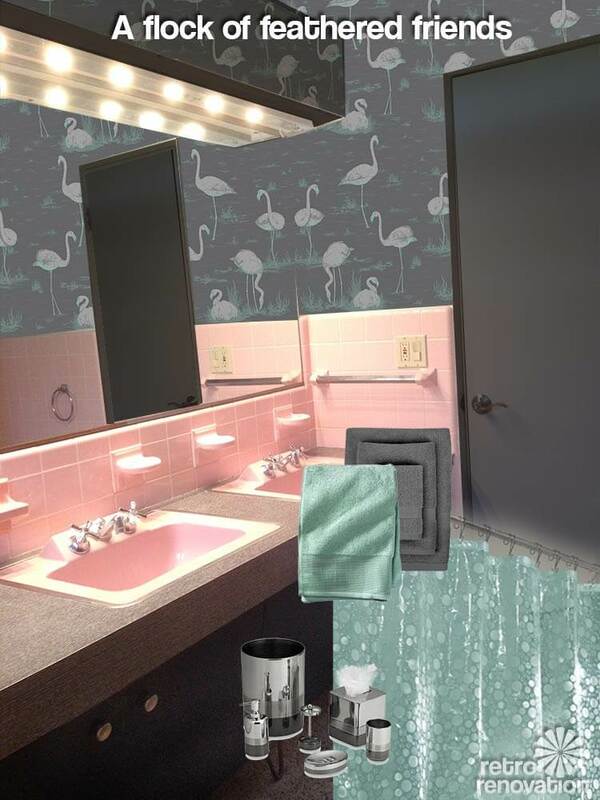 It was definitely surreal to see so many people comment – and especially knowing someone recognized the flamingo tiles. I will definitely take all the input into consideration and will hold off on doing anything drastic. I appreciate what your website has done for allowing uninformed home owners (like me) to embrace restoration. My plan forward is to hold off for a while until I have a set idea of what works/doesn’t work functional-wise instead of going full force too soon. I had just always envisioned an updated bathroom and never a 50s bathroom, so it was difficult to overcome the desire to renovate. I think in time I will learn to embrace the style more. As a side note, rest assured that I have not had that same mind frame with the rest of my house. There are many mid-century elements (like my indoor planters) that I have painstakingly worked on preserving. Gus, we’re glad you are taking the time to live with the space before doing anything drastic. It will be interesting to see what you end up deciding to do (or not do). Keep us in the loop. What strikes me as most girly are the “makeup mirror” lights on your soffit. What about changing them out for some cool pendant lights? That will modernize and masculinize it if you want, and will be cheaper than messing with all that tile. Then paint or paper the soffit and other walls in a medium or dark gray that will look great and will tie the whole room together with that awesome (and also dark) vanity. I found a cool gray patterned paper from Bradbury&Bradbury (bradbury.com). And if your bathroom is anything like mine, those tiles are cemented on so tampering with them will be a disaster! I also agree with living in the house for a while as you decide what to do. Send Pam & Kate a photo when you update so we can all see what ended up working for you! I might rethink permanently personalizing and making a master bath masculine if you’re concerned about resale. Your next buyer may not be a man. What would make a buyer want something is knowledge. Your decorated tiles are very special and collectible. They were made by the American Olean Co. You can find a page from an original catalog in another RR post picturing these tiles. The colors on the flamingos make them especially desirable. Most likely they are also embedded in thick cement and would be impossible to remove safely. To replace just that central tile would cost between $300-600. Why not add a grey or black marble / granite shelf above the top border? Tone the pink down with shades of grey accessories. I have to agree with everyone and WAIT!! I bought a mid century house and the first thing we did was tear down the pony wall in the entry. 11 years later, I am sick over it and going to have it built back! Our bathrooms were redone in the 90’s by the original owner. However, what was modern in the 90’s is out dated now. So now we have two problems; the bathrooms are totally dated looking but not even dated to the style of the house! 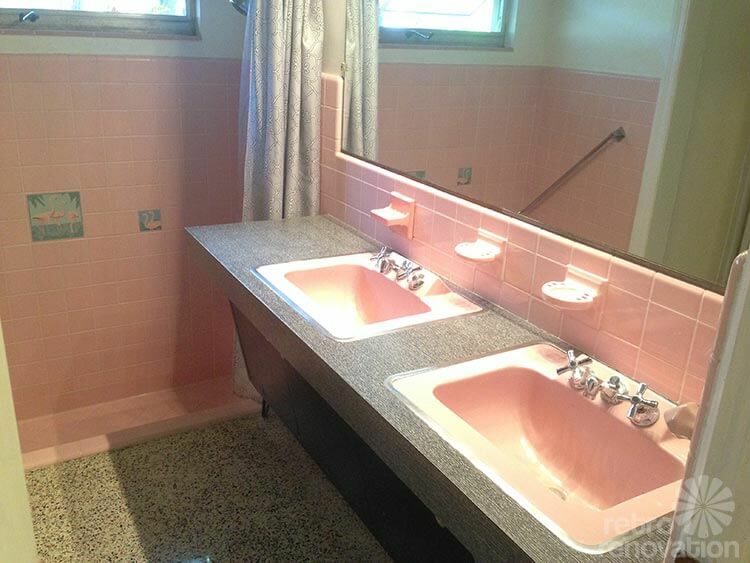 I found both a pink and a turquoise sink and toilet on the side of the road one day. These are in my garage for my next project to restore my bathrooms to their original glory. My husband is even excited! In fact, I am going to use your bathrooms as my inspiration if you don’t mind!! You have a piece of history and it appears to be in great shape to boot. I would WAIT and live with it for a while. Paint the upper walls a nice shade of gray or match the vanity. Buy modern stainless accessories, a sleek modern square rain shower head and two sleek modern light fixtures to go over each sink. And if you do decide to sell, call me first!! I live in Florida and I want your house! Your bathrooms are my dream bathrooms and are hard to find!! I love it. It’s awesome. 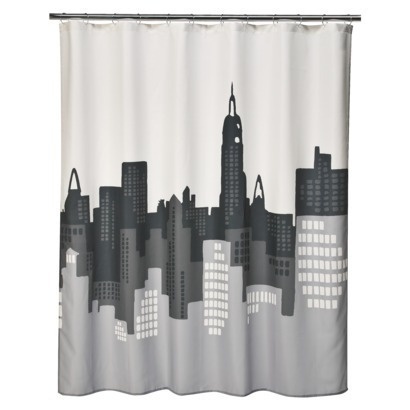 I have this shower curtian in my pink bathroom (from Target), with grey walls and grey towels. I was also going to suggest adding grey. Lots of grey. It’s also kinda fashionable right now, along with pink. I have two, my shower curtain wraps around two sides of the tub and it was a good deisgn to wrap around.